We recently discovered an amazing new artist specializing in epic, sci-fi and horror artwork, and we’re excited to share his stunningly dark and gothic art with our readers. Aldo Requena (aka, Valgorth) is an incredibly talented self-taught artist from Argentina. His work his highly inspired by Lovecraft, Giger, and similar artists — with a lot of input in darkness and rebellion. Requena has been working in the music and entertainment industry for over 8 years. His breakthrough came in 2005, when he produced the cover art for the heavy metal band Paragon. In 2008, he established his own design studio, Hammerblaze.com, Since then, he’s produced art for many bands and labels (specifically in the heavy musical arena), including the Swedish band Lost Horizon, Skiltron, Black Majesty, HolyHell, In-Defilade, Sonic Prophecy, Remedy Records, Vic Records, and many more. He’s also worked on illustrations for video games, like ‘Game of War’ and ‘Vain of Glory’, and developed concept art for the book depicting the life of Scottish folk hero William Wallace by author/fight director Seoras Wallace (Braveheart, Gladiator). He’s part of the creative team of Kingdom, a UK comic book project. He’s also the creative associate for Flash-Back 2029, a retro post-apocalyptic industrial band. On top of all that, Aldo is currently publishing his first art book “Mystic Rituals” this July. We absolutely love his band and professional work, which you can see more of at Hammerblaze.com. But what really made us fall in love with this uniquely talented artist is his personal, darkly-inspired art. 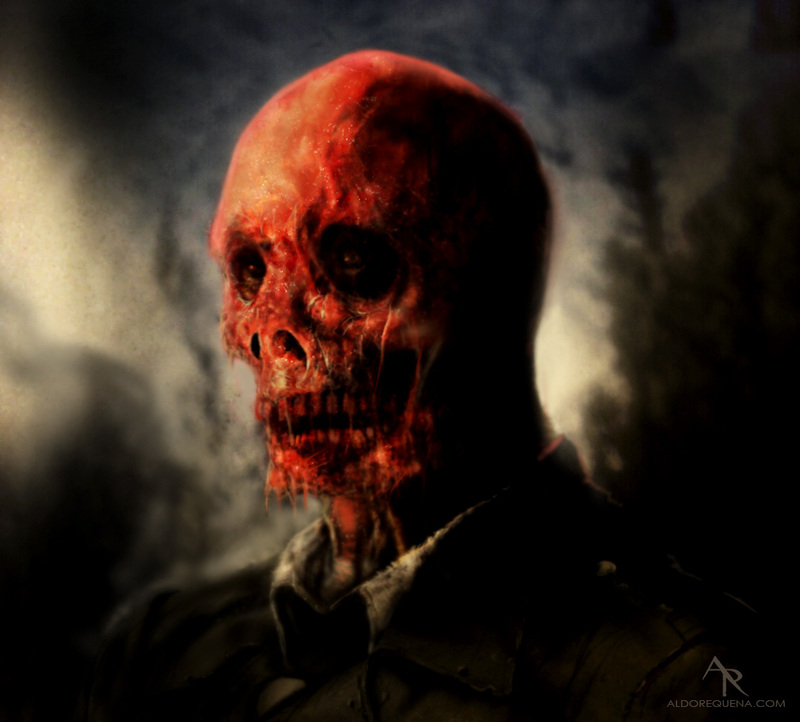 It’s creepy, twisted, and horrific… but also extraordinarily beautiful. 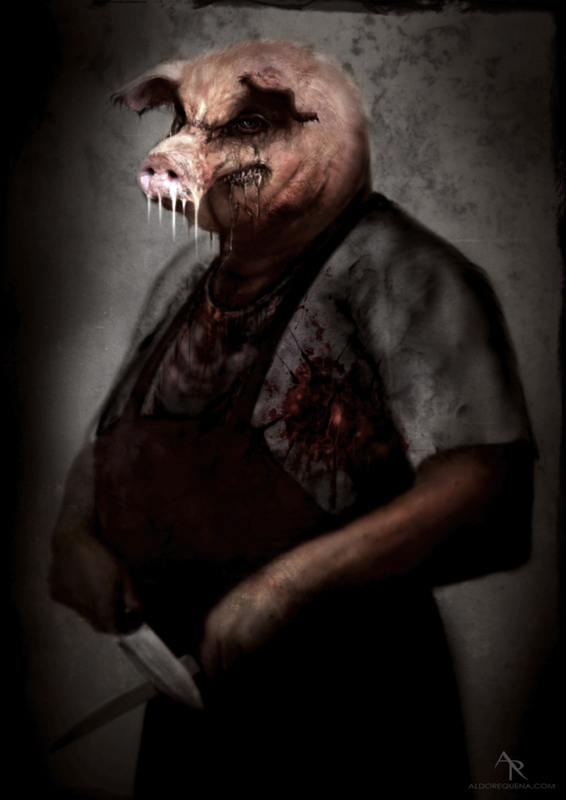 If you head over to his personal site at aldorequena.com, you can get a better sense for the artist’s personal style and view some of the horror-inspired characters he’s created (like the terrifyingly perfect Pig Man below, one of our personal favorites). Check out Aldo’s mind-blowing demo reel below. He’s currently accepting commissions. So, if you’d like to work with this insanely talented artist, email him at info@hammerblaze.com or message him at Facebook.com/AldoRequena.